For companies like Effi Enterprises who provide private equity financing and advice on how to establish value in a company until they can offer an IPO, the stock market must be a trusted entity. Some of the recent computer glitches in the market have made some investors such as Efraim Landa somewhat edgy about the market. Effi Enterprises offers quality counsel and advice about how emerging businesses and entrepreneurs can add value to the company and how they can successfully handle financial investments. To be able to disperse quality information Effi Enterprises stays abreast to all the changes in regulations which occur to influence the stock market. One of the acts which helped shape today’s market is the Glass-Steagall Act which was finally repealed. The Glass-Steagall Act (GSA) was drawn up in response to the stock market crash which occurred in 1929. The GSA set up a sort of wall to divide commercial banking activities from investment markets. This was because of the large amount of commercial bank involvement in the activities which led up to the crash. Most felt that banks took too many risks with the money of their depositors. The GSA limited the activities that banks could engage in as an effort to protect consumers, the banks and the market. The Act stood until it was finally repealed in 1999. Many felt that banks were very careless with investing practices prior to the Great Depression. They invested their assets and took greater risks trying to gain larger financial rewards, most call this greed. The concept of banking became blurred and complicated because banks made loans to companies that they had also invested in; they also tried to encourage their other clients to invest in stocks with these companies as well. Many financial advisors felt that this was a grievous mismanagement of funds and was behind the huge stock market crash. The House Banking and Currency Committee was chaired by Henry Steagall at the time and he was also a member in the House of Representatives. Senator Carter Glass is responsible for founding the US Federal Reserve System. These two worked together to create the GSA. They got it passed after an additional amendment which allowed insurance on bank deposits for the first time in history. The GSA was developed in response to the market crisis and developed a sort of firewall to regulate and separate investment banks from other commercial activities. At that time, banks had 12 months to choose if they were going to specialize in commercial banking or investment banking. The Act was set up to limit a bank’s income from securities to 10 percent. However there was one exception in that commercial banks could underwrite bonds which were issued by the government. Large financial corporations such as JP Morgan were forced into cutting many of their services which had a direct impact on their overall income. GSA was enacted to keep banks from using their depositor’s money to underwrite failed jobs. But there were many among the financial community who felt like the regulations put into place by this Act were too harsh and as soon as it passed there were some who began a repeal immediately, Glass was one of those who realized the Act was largely an overreaction to a crisis situation. 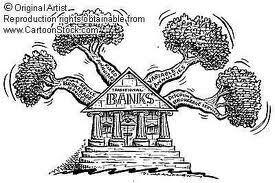 In 1956 Congress chose to enact regulations on another bank sector. The GSA was extended with the addition of the Bank Holding Company Act in order to put a protective wall between insurance companies and banks. This prohibited banks from underwriting insurance companies although the banks were still allowed to sell insurance. Over the years there have been many debates about how healthy these restrictions are for the industry. Most felt like they were too strict; and that banks should be allowed the opportunity to diversify. They feel that diversifying helps reduce risks and that the GSA enacting restrictions had had a negative effect on the industry instead of a positive one. Banks have become more transparent after incidents such as Enron and they are likely to be more careful and take fewer risks with regard to investment decisions. Banks understand that reputation is an important part of today’s market and this helps motivate banks to keep strict regulations on their own. Congress repealed the GSA in November of 1999; this removed the restrictions which were in place to prohibit affiliations between commercial banks and investment banks. With the repeal game the Gramm-Leach-Bliley Act which allows banks to operate in broader services and this includes underwriting. While the initial intent of the GSA was preventing deposits from loss in the event of investment failures it shows that sometimes the attempt to regulate can have the adverse effect.